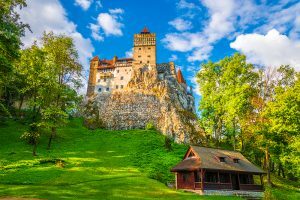 When you say Bran Castle, Romania, the first thing that comes to mind is Dracula. Due to the myth, Bran is one of the most famous castles in South Eastern Europe. However, back in the ’80s the castle was quite unknown, with few visitors. After the Dracula film was released, it became a worldwide attraction. Every year, thousands of people pass through its gate, in search of mystery, or out of curiosity. 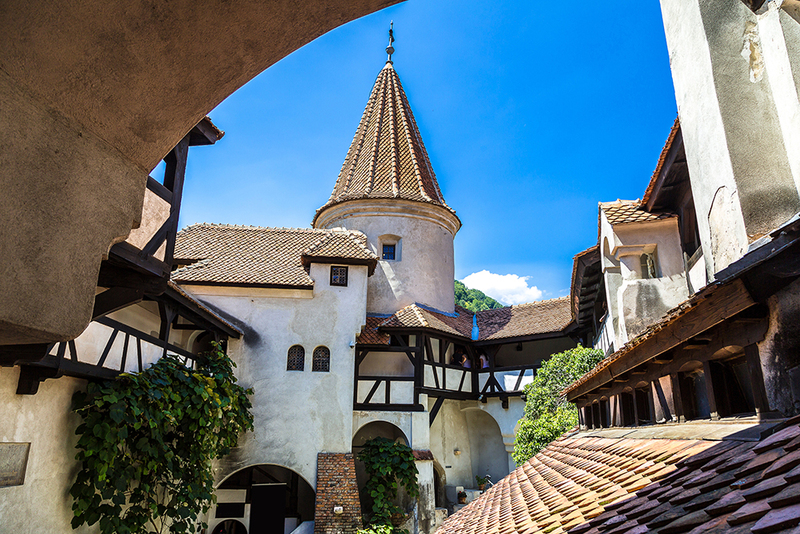 Bran Castle has thrilling things indeed, but they don’t involve vampires. The castle was built in a picturesque area and offers a lovely mountain view. 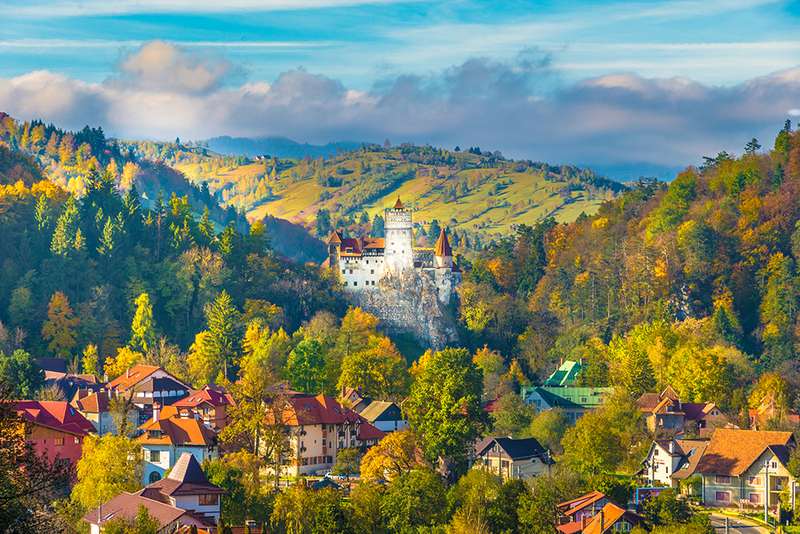 It was built by the German population in Transylvania, as a defense fortress. That happened 600 years ago, when the Ottomans (Turkish people) used to attack Transylvania. This is why it’s built on a cliff and it has a view of the valley, so they could see the Turkish approaching. Bran name actually means ‘gate’. The visitor still has to climb up a path to the main building, not very steep though. I visited it in May, when the nature was blossoming. Everything around Bran was green and fresh and there was a spring feel in the air. So nothing spooky, no sign of vampires, just splendid nature to be admired. The tree-fringed path led me to the castle’s gate, at the end of the staircase. A large group was in front of me, taking photos of the stone cross guarding one side of the castle, as a symbol of Christianity. The first room the visitor enters is a room adorned with photos of the Romanian Royal Family, especially of Queen Mary and her daughter, Ileana. 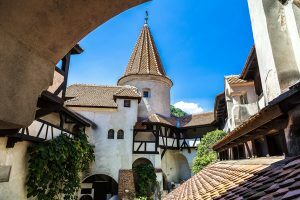 Yes, Bran Castle was a Royal Residence. It was offered to Queen Mary as a gift in the 20s, by the Brasov City Council, as gratitude for her involvement in the First World War and the Romanian Great Union. Queen Mary was a writer, a nurse during the war and an intelligent and elegant woman, whose influence and diplomacy helped the country and its people. She was the grandmother of King Michael, the late king of Romania. After the photo room, we began the actual tours through the castle. As any castle Bran has rooms for each purpose. We, as visitors, saw a bedroom, the music room, with a piano, the living room with a lovely chimney and an old chess table. We also enjoyed the guest room and the King’s room. Unfortunately, not much of the original furniture is there. Still a Chinese embroidery caught my attention. It seemed one of the original pieces. One of the main attractions for those in search of adrenaline and shivers is the secret staircase. It is no longer a secret, as all tourists walk up the dark and narrow, claustrophobic stairs. However, it used to be a secret escape back in the days when the castle was attacked, especially by Ottomans (Turkish). From the staircase the visitor can reach an open attic and enjoy a magnificent landscape: green hills, forests and the serpentine road. The terrace was built quite late in the castle history. Passing through Bran balconies on the way out, I had a view of the inner yard of Bran castle, with a small fountain in the middle. As any other medieval castle, Bran couldn’t lack towers and they are typical of the period. I couldn’t help thinking that Bran Castle looks like a fairytale castle, guarded by mountains and woods. Across centuries it has had different owners, German, Austro-Hungarian and Romanian. What about Count Dracula? So far Bran seems just a normal 14th century castle, in a picturesque landscape. It seems that Vlad the Impaler (the Romanian ruler linked to Count Dracula) stopped in Bran a few times in his way to Transylvania. But he wasn’t from Transylvania, he was the ruler of Valachia. History tells us that Vlad the Impaler had conflicts with the Germans around Brasov area (the county where Bran is) and they wrote some stories about him and his cruelty. The stories became legends, as it is still unknown how much truth is behind them. Bram Stoker was inspired by these stories and he created the famous character. Bran is definitely worth visiting, not only for the myth but for its history and architecture, for the area and for the traditions. Close to the castle’s main gates, there are stands with traditional Romanian food, such as cottage cheese, honey and wine. They are all produced by locals and they are bio. Also, the tourist can find Romanian national costumes, including the’ ie’ an embroidered cotton blouse worn by women. If you are in the mood for a hike through the forests and a climb up on the mountain, there is a small monastery on a mountain plateau. It is surrounded by peaks and caressed by sun rays. The walk takes a few hours, some kilometers through the woods, but once there the whole view is priceless.